The hotel itself is a clean, roomy hotel with few amenities. Parking is free and scarcely monitored, despite the hotel's relative proximity to downtown proper with its convention centers. Service was friendly and the staff entirely competent. 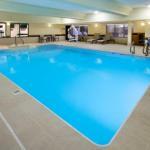 Located four blocks from the RCA Dome and the Indiana Convention Center. The only thing that gives me pause is that the hotel is located near the state capitol building, that is to say, the surrounding buildings largely service the state government. Very much a 9-5 affair, and so the streets immediately surrounding the Hotel were empty after dark. Downtown Indianapolis seems to be quite safe, and I didn't stay out too late, so I didn't feel too uncomfortable walking around, but it is somewhat inconvenient that restaurants and other stores are located a good five blocks away. Rooms were spacious and clean, free parking, within walking distance of RCA Dome. After 6pm, the surrounding blocks were deserted, had to walk 15 minutes to reach restaurants, shops, etc. Very convenient for me going to school at IUPUI. children appeared to be jumping on beds or in hall. My family has stayed at this hotel several times. They are always very gracious to make sure we can have 2 separate beds since we have a family of four. Did not have continental breakfast for 2.5 star hotels. The 116-room Courtyard by Marriott Indianapolis at the Capitol is in the heart of downtown Indianapolis close to the Indiana Convention Center, and provides quality accommodation equally suited to the business or leisure traveler. The four-story, non-smoking hotel has two meeting rooms for social or business functions. The larger can accommodate 35 guests. Items included with the room rate are high-speed Internet access, local telephone calls, a morning newspaper and coffee available in the lobby 24/7. Nearby landmarks and attractions include Lucas Oil Stadium, the Childrens Museum, Conseco Field House, Indianapolis Zoo, NCAA Hall of Champions and the Eiteljorg Museum. All the guestrooms, and eight suites, have a work desk with high-speed Internet access, cable television with movie and news channels, pay-per-view movies, pullout sofa bed, alarm clock, tea and coffee making facilities, iron and ironing board, hairdryer, and two dual-line telephones with voicemail and data ports. Some rooms have the added benefit of a Jacuzzi and a microwave oven and refrigerator. Video games and players are available for rent. This hotel has an indoor swimming pool and whirlpool. The National Institute for Fitness is half a mile from the hotel. Breakfast is the only meal served at The Courtyard Café but there are several restaurants within walking distance including the Bourbon Street Distillery, the Champions Sports Bar and Grill and the Circle City Bar and Grille. The 24-hour front desk has safe deposit boxes and information on area events and attractions. Other amenities include a full service business center, a coin-operated laundry, vending machines, valet dry-cleaning, a picnic area with barbecue grill and a gift shop and newsstand. The great downtown location, friendly and efficient staff and comfortable beds and accommodation: These items make this Marriott property a winner with many former guests. There were complaints that the prices are high but so was the service and comfort. Others said comparable accommodation in full-service downtown hotels was double the amount charged here. Advice from former guests: An evening stroll along the canal is a must-do item. Parking: Yes, there is parking. The cost is $12 per day.